Keith Heck, Franchise Owner/Home Inspector. As the Franchise Owner of AmeriSpec Home Inspection Service of Lloydminster, Keith brings over thirty years of experience in residential and commercial buildings, including renovations and new construction. He has been a Home Inspector for eleven years and is WETT certified to inspect wood burning appliances, including fireplaces and wood burning stoves. Keith is also a General Contractor and a Carpenter (framing and finishing, renovations, custom deck design and construction), with twenty years of practical experience building residential and commercial buildings. 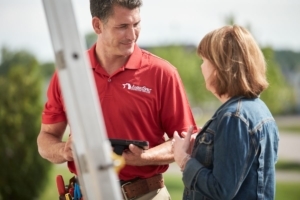 Some of the specialty services that Keith provides are: Home Energy Evaluations, Pre-listing Upgrade Consultations and Home Improvement Consultations. He also has a broad understanding of HVAC and HRV systems, hot water heating and in-floor heating design and installations. Beccy is the Office Manager at this franchise location and has been with the team for over 6 years. She is the main connection between our customers and the inspectors and keeps the inspections booked in a timely manner and the schedule running smoothly. Have a question for us? Want to schedule a Service? Click here.